The Gutenberg Bible does not mention the names of the printers or the place and date of publication. Historians of printing credit Gutenberg with the invention and believe that he and his associates printed the Bible in Mainz around 1455 on the basis of the Helmasperger Instrument and corroborating evidence such as a dated inscription in one of the surviving copies and an eyewitness account of Aeneas Silvius Piccolomini (the future Pope Pius II) who had seen sample sheets on display. The documentary evidence does not answer all the questions about Gutenberg's business dealings, but scholars have made great progress in learning about his ideas and techniques by studying the books themselves. The physical evidence suggests that letterpress printing, like other great inventions, posed a series of technical challenges, each of which had to be overcome to achieve practical, commercially feasible results. Beta-radiographs of watermarks in the Morgan copy PML 19206-7. Paper. Vellum was expensive. By making copies in quantity, printers could sell books at reduced prices. They could drive down the price even more by using another important technological innovation, paper, a cheap and durable writing substance invented in China and significantly improved in Europe during the thirteenth century. Already paper had made it possible to cut the cost of manuscript production, but it truly realized its economic potential with the invention of printing. 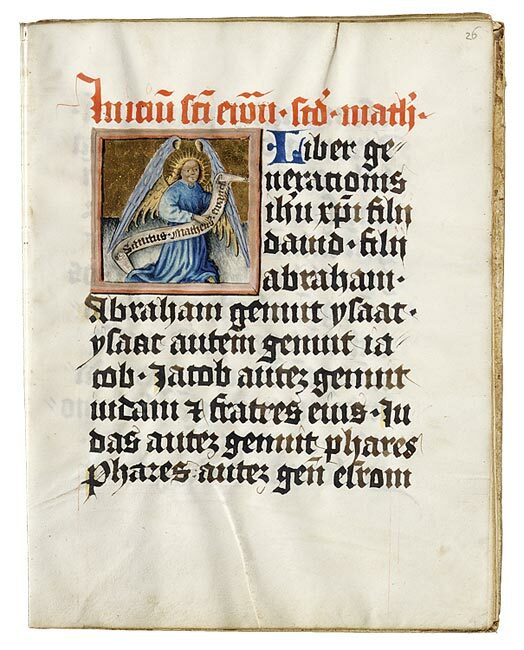 Still crisp and firm, the paper used in the Gutenberg Bible was manufactured in the Piedmont region of the Alps and shipped down the Rhine to Mainz. 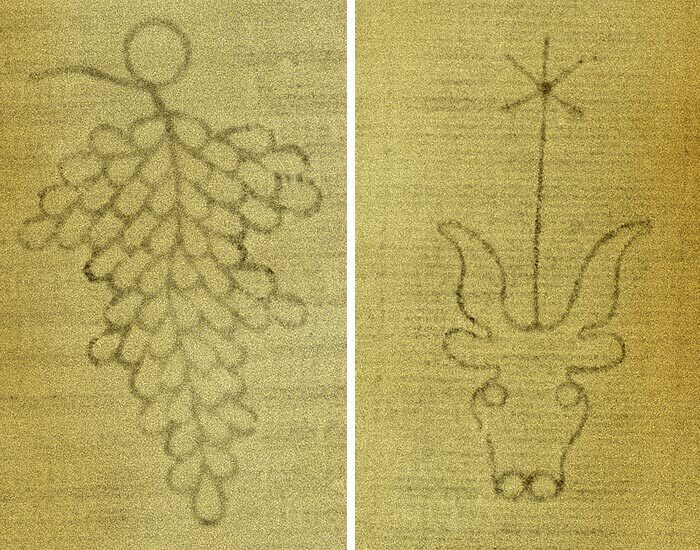 The Bible printers bought paper in several installments, which can be identified by the watermarks, such as the bull's head and grape cluster shown here. Textura script, Gospel Lectionary, Germany, Regensburg, ca. 1430–1440. Purchased by Pierpont Morgan with the Bennett Collection, 1902. MS M. 77 (fol. 26r). Type. Gutenberg developed techniques for casting types and composing them letter by letter and line by line. Recent research raises questions as to exactly how the types were cast, but there is no doubt that they were produced with immense effort, extraordinary skill and a prescient appreciation for the nuances of letter design. The complete font consisted of about 270 characters, including ligatures, abbreviations and "abutting sorts" designed to display the even weight and rhythmic grace of textura letterforms to optimum effect. Here is a typical example of the most formal grade of textura script in German liturgical manuscripts of this period, a stylistic model easily adapted for the purpose of printing Scripture in a size large enough to be read out loud. Ink. The water-based inks used in manuscript production would not adhere to metal types. Gutenberg formulated an oil-based ink with the desired physical properties as well as a rich glossy appearance unparalleled in early printing. Scientists studying the composition of this ink have detected unusual ingredients, metallic compounds that may be responsible for its intensity and sheen. In more ways than one Gutenberg was a master of the Black Art. Presswork. Connoisseurs of fine printing have always admired the remarkably precise and uniform impression in the Gutenberg Bible. How Gutenberg achieved such high-quality presswork is not known, but he must have devised a mechanical means of applying ink to paper under ample and consistent pressure, almost certainly with some kind of a screw press, machinery already in use at that time in wineries and paper mills. Afterthoughts. Gutenberg had to make some compromises in the course of production—as if he was still learning the constraints as well as the potential of his invention. At first he intended to print some text in red, the rubrics signaling the beginning and the end of various sections of the Bible. The results were perfectly satisfactory, but the experiment had to be abandoned because of the extra time and effort required to print a second color. An example of one of his printed rubrics can be found on the top of leaf I,129r. Likewise, he originally expected the page to contain 40 lines of text but soon decided that he would have to economize on paper and presswork by trimming the type to fit two additional lines on a page. You can see the two states of the type in the same two-page opening. Leaf I,129r on the right was printed with the type in the original 40-line size, leaf I,128v on the left with the same type in the smaller size—an identifying feature of the Gutenberg Bible, known to bibliographers as the 42-line Bible, or B42 for short.